Lots of people throw around quotations attributed to ancient authors. Last year I read the Annals and Histories by Tacitus. Since then I’ve found writers who seem to have reason to beat up on him. But not everyone who refers to ancient authors actually reads the works they use and abuse. The early Christian writer Tertullian may be a case in point. In Apology 16 and Ad Nationes 1.11 he attacks a pagan derision against Christians having to do with the worship of a donkey’s head. He takes Tacitus to task as the originator of the insult, a possible example of which is visible in an ancient scrawl known as the Alexamenos Graffito. This was found inside the excavation of a former Roman boarding school for imperial page boys. 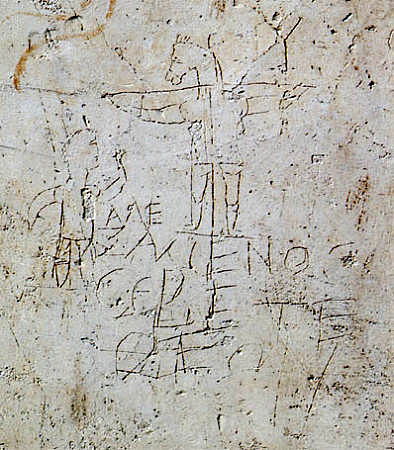 It appears to depict a victim of crucifixion with a donkey’s head, as well as an inscription that could be read as “Alexamenos worships his god.” According to Tertullian, Tacitus was the first to convey the insult. This is speculation entangled in arguments from silence. It is hardly surprising that there is no mention of Jesus or his execution in the extant portions of the Annals. Why would the execution of yet another obscure Jew in Palestine be noticed in Rome? Roman governors recorded what they did and sent reports home. But as Pliny’s letters to Trajan suggest, the reporting was likely to contain a fair bit of self-promotion and flattery. If Pilate’s messaging to Rome said anything at all about Jesus it would have been a very brief bit that cast any relevant events in the best possible light. And it would vanish into a hand-curated archive along with all the other provincial reporting. Rome is the center of the universe for Tacitus. Jesus wouldn’t even be a blip on the first century Roman radar except for Nero’s pogrom. Which means information about Jesus possibly filtered into Roman thinking via the Christians themselves, including whatever names they used. But Tacitus did not appear to view the report of the execution by Pilate as controversial as it is not accompanied by qualifiers that appear elsewhere in his writings. And what other “messiah-figure” could the passage possibly be talking about? One of the Vestal Virgins? This claim makes no sense in the context of Roman history. And the flow of the passage referencing the fire appears consistent with the rest of Tacitus’ writing. The bar for tagging this section as a forgery seems quite high. But I digress. The asserted quotations by Origen and Tertullian are the focus of my interest. It would have been helpful to have references. I am unable to locate anything in Origen’s writing naming Tacitus which likely reflects my ignorance of his work. But Tertullian does specifically name him, and refers to the Histories. Time to read what Tacitus actually wrote. In this context a characterization of the Jews as worshiping an animal might be more than what Tacitus intended to say (this would need to be confirmed by someone with a command of Latin). But what is extremely odd is that Tertullian did not cite this additional bit. In both Apology and Ad Nationes Tacitus is accused of self-contradictory falsehood, by elsewhere describing Pompeii’s failure to find an image when he entered the temple after capturing Jerusalem. Tertullian also does not mention Tacitus’ explicit dependence on other writers. Contrary to what Tertullian states, Tacitus is not the origin of the story about the donkeys. There is a very good possibility that Tertullian was not working directly from a primary source. It is possible he may have been working from fragmentary copies, or possibly his memory of having read the texts at some point. But given the high divergence from the actual writings, it is far more likely he is using material transmitted by way of an intermediary — someone else’s oral or written references to to Tacitus’ works. Tertullian demonstrates at least some familiarity. Tertullian refers to Tacitus in Ad Nationes 2.12, in what appears to be a sweeping but somewhat offhand reference in the context of an argument about the human origins of pagan divinities. But that is not the same as actually reading from complete copies of the Histories and Annals. One could just as easily argue that a social media posting referencing Sun Tzu demonstrates a direct reading of The Art of War. Any argument that depends on the direct access of one ancient writer to another is potentially problematic in the media context of the ancient world. It encapsulates gratuitous assumptions about the diffusion of documents over time and distance. This was an era of manuscripts laboriously copied by hand, as well as arduous travel powered by animals, sail, and human feet. Diffusion over time is possibly not at issue, as Tertullian was born roughly a century later than Tacitus, but he lived across the Mediterranean in North Africa. It’s not like he could walk into a local bookseller and order a scroll. Absent actual evidence of quotation there would seem to be a need to demonstrate a reasonable availability of the primary source material. Without this any errors or omissions by Tertullian become no more than probable artifacts of manuscript transmission in the ancient world. Ancient writers are not wholly silent on the events treated by Tacitus. Paulus Orosius refers to the fire and a Neronian persecution. The History against the Pagans 7.7 on Nero summarizes the events but does not link them. Sulpitius Severus, however, is explicit about Nero’s attempt to scapegoat Christians for the fire in Sacred History 2.29. The material is unattributed, and backstopped with an interpretation of The Apocalypse of John. It is possible that Severus is using an independent source, but the language appears very similar to that of Tacitus, minus the pejorative characterization of Christians. Unlike Tertullian, Severus appears to have been working directly from what Tacitus wrote, and not been forced to rely on memory or someone else’s references. Tertullian could be excused for working with what he had. Modern writers have no such out. Raphael Lataster, “Questioning the Plausibility of Jesus Ahistoricity Theories—A Brief Pseudo-Bayesian Metacritique of the Sources.” Intermountain West Journal of Religious Studies 6, no. 1 (2015) PP 84-85. (78) Bart D Ehrman, Bart D. Did Jesus Exist? : The Historical Argument for Jesus of Nazareth. New York: HarperOne, 2012. p. 54. (79) Earl Doherty. Jesus: Neither God Nor Man. Ottawa: Age of Reason Publications, 2009. pp. 596-600. The proprietor of the publisher appears to be the author. Self-publication is common (like this blog) however the book is not identified as such in the paper’s bibliography. This seems rather odd for a peer-reviewed journal. Anyone thrashing about over the origins of New Testament texts and how we read them ought to pick up a copy of Jesus and the Eyewitnesses, by New Testament scholar Richard Bauckham. The book provides an analysis of oral tradition, first century personal names, and literary evidence relevant to the Gospel accounts. The analysis is used to support an argument that the accounts are directly anchored in the eyewitness testimony of close associates of Jesus. The argument is a counter to the view that they are wholly the product of oral community traditions, and as such, changing over time to conform to how the community views itself. Proponents of this seem to want to decouple early Christianity from any connection to actual participants in historical events. I am part way through the book and am finding it very helpful in framing how I think about the Gospel texts. Early in the book Bauckham cites a study of Palestinian Jewish names to support his thesis. The study is based on the work of Israeli scholar Tal Ilan. Ilan compiled Jewish names used in Palestine between 330 BCE and 200 CE. A large amount of the data comes from the first century and the beginning of the second century CE (to 135) reflecting the relative abundance of sources in this period compared to the full span of five centuries. The sources include the New Testament, as well as others such as ossuaries, inscriptions, the works of Josephus, and other Judean texts. Bauckham describes a correspondence in the study between the relative frequencies of personal names in the Gospels and the relative frequencies of these names in the total study. For example, Simon and Joseph are identified as the two most popular male names and comprise similar percentages of the names counted in the Gospels and Acts, as compared to the rest of the data. But what Bauckham says would seem to rest within a broader point. The name correspondence provides an independent anchor in time for possible dates of authorship of the written Gospel accounts, as well as an anchor in geography for possible sources. Bauckham notes, “…that a large proportion of the data actually comes from the first century CE and early second century (to 135 CE), just because the sources for this shorter period are much more plentiful than for other parts of the whole period.” But he doesn’t flesh out the significance of the identified date. 135 CE was the year Roman legions suppressed the Bar Kokhba revolt. After the revolt the Romans depopulated Judean Jewish communities and Jews became a minority in Palestine. The Romans also suppressed Jewish religious expression; this eased only with the death of the emperor Hadrian in 138. The center of the religion subsequently shifted east to the Babylonian Jewish community. The incidence of Palestinian Jewish names is lower after 135 because the Romans had removed (most of) the Palestinian Jews. What this means is that the writers of the Gospel accounts either 1) lived in Jewish Palestine before the revolt or 2) were relaying material directly from pre-revolt residents. The combination of Roman military activity and the subsequent deportations likely eliminated any further avenue for oral transmission from Palestinian Jewish communities. Which means the name correspondence firmly anchors the Gospel accounts within the living memories of pre-revolt residents of Jewish Palestine. This does not definitively say when, where, and by whom the Gospel accounts were written — but the Bar Kokhba revolt imposes absolute bounds on the range of possible answers. These bounds backstop existing scholarship answering those questions, and apply whether or not Bauckham’s thesis is correct. Bauckham, Richard. Jesus and the Eyewitnesses: The Gospels as Eyewitness Testimony, Grand Rapid, Michigan: Wm. B. Eerdmans Publishing Co., 2006, ISBN: 0802863906. 2013 Kindle Edition p. 73. It has occurred to me I might be missing something far more basic. Thinking about how Christianity spread underground in a frequently hostile ancient world could provide some clarity. Historical accounts are generally focused on specific events behind these events are often hints of something else. The writing of Eusebius of Caesarea are no exception. Eusebius documented the imprisonment, torture, and martyrdom of his teacher Pamphilus, along with members of his household. These included the slave Porphyrius who spoke out after the condemnation of Pamphilus asking for the burial of the bodies. There was more connecting Porphyrius and Pamphilus than their relative social positions would suggest. Over a period of roughly 300 years Christianity grew from a local splinter sect within Judaism to become a very large minority within the Roman empire at the accession of Constantine. But in the interim treatment of Christians varied from times of toleration to periods of targeted persecution. Christians weren’t always direct objects of persecution. Sometimes they were swept up in general campaigns to restore traditional Roman values which included worship of traditional gods. Judaism was tolerated because it was backed by the history and traditions of the Jewish people. But once Christianity became distinct from Judaism it was viewed as novel superstition and inherently impious*. A refusal to sacrifice to Roman gods carried at least a possibility of impoverishment, imprisonment, torture, and death. An aspect of Roman judicial process heightened this risk. Rome frequently relied on informants who might benefit from their involvement. These included accused criminals, delatores (paid a fee or a portion of asset confiscation), and slaves, who could benefit by emancipation. The testimony of slaves would be verified by torture which would serve to dampen but not remove the incentive. The incentive to inform provided by the judicial system meant that persecution need not be driven by direct edict by an official. Trajan advised a governor not to hunt for Christians, but to punish them if they were denounced and convicted. If a local official was known to be hostile the prospect of personal benefit could drive the process of denunciation, particularly as Christianity penetrated the households of the well-to-do. In this context, involvement in Christianity would take on aspects of a criminal conspiracy, albeit one which placed a suicidal premium on telling the truth when caught. It would necessarily spread through networks of personal relationships between people who knew and trusted each other. There is neither Jew nor Greek, there is neither slave nor free, there is neither male nor female–for all of you are one in Christ Jesus (Gal 3:28). As Porphyrius and Pamphilus appeared to be. The question about why people are leaving church might hinge on answering questions about the state of our personal relationships. Would those relationships survive contact with a hostile government? Do I know people in my local church well enough to trust them with my personal safety? And would they trust me with theirs? *For an overview of see Christian Persecution at UNRV History and Anti-Christian policies in the Roman Empire.